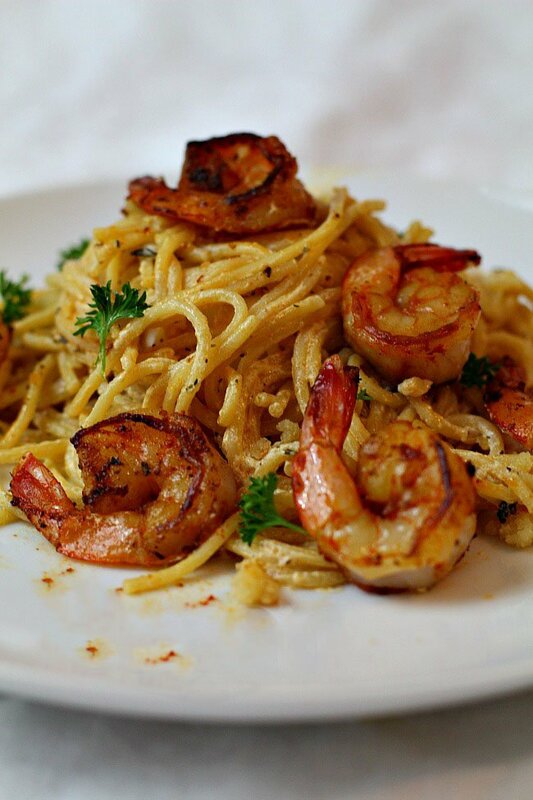 This Spicy Creamy Shrimp Pasta Recipe is simply spaghetti made heavenly with a white wine, Parmesan cream sauce. Then spiked with paprika, cayenne, thyme and garlic. Just add sauteed shrimp and you’ve got a beautiful dinner that you’ll want to make over and over again. Plus, a conversation about finding and buying quality shrimp and tips for pan frying shrimp. 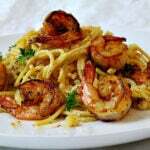 It appears that shrimp and pasta recipes are very appealing to my readers. Due to the popularity of my Angle Hair Pasta with Shrimp and Creme Fraiche, I decided to feature another creamy shrimp spaghetti recipe. This time a little more on the wild and spicy spicy side. This might just be me, but one of my favorite things to do is go to a store that has a great selection of interesting pasta shapes and pick out something funky.Which is exactly what I did when this recipe idea came to fruition. I wanted something nubby and thick, that could easily be stabbed with a fork. Something with nooks and crannies for a cream sauce to hide and seep into creamy nirvana. Something that would compliment the shape of a perfectly little curled up cooked shrimp. After about 10 minutes on that pasta aisle, studying the tortellini and the ziti’s, that good old box of boring spaghetti screamed “hello creamy cheese sauce with shrimp”. Done, decision made. Those little curly shrimp would look perfect on a simple bed of spaghetti that I could swirl into any shape I wanted. Perfect for my idea for spicy shrimp pasta recipe. Before we get to the recipe, let’s talk about buying shrimp. And buying quality shrimp that tastes like shrimp. We’re big on shrimp around this house, and being landlocked, good quality shrimp can be hard to come by. 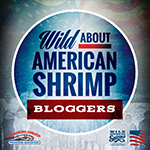 I feel so fortunate that I was contacted by the folks over at the Wild American Shrimp a couple of years ago, because they have have the fabulous opportunity to learn what makes a tasty shrimp. Shrimp that tastes like it should. And to stop grabbing for those bags of frozen shrimp from Thailand. The experience of fresh caught and flavorful shrimp from the nutrient-rich waters of the Gulf of Mexico is all I will buy now. Flavor just like I remember from the wonderful dishes I had in New Orleans. Simply stated, superior in flavor and texture. Every Shrimp has a tail, but wild-caught American Shrimp have a story rich with flavor, history and adventure. It’s about hard-working families who date back to when shrimp were harvested on wooden sailing vessels and peeled by hand. It’s a story of American jobs and livelihoods and an industry’s resilience against tough times. You’re probably asking, where can I buy wild American shrimp? You can have their Gulf shrimp shipped directly to your doorstop or take a look at their website for a list of local shops where you can purchase American shrimp. Nationally they indicate you’ll find it at Walmart, Sprouts and Whole Foods. There is also lists of regional markets and on-line sources who will ship direct to your door. Buy easy peel, deveined shrimp. After peeling, pat shrimp dry with a paper towel before adding to hot oil. I like to lightly season them with salt and pepper. Heat your pan on medium high heat before adding oil. When the pan is heated, then add oil. When oil is shimmering and hot, then add shrimp. Leave space between the shrimp in the pan. Don’t over crowd. This will insure a crispy sear. Cook until shrimp is starting to turn pink, and no longer wants to stick to the pan. Then turn. To know if shrimp are cooked properly: straight shrimp are undercooked, shrimp curled into a “C” are done, shrimp closed in a tight curl are overcooked. I hope you give this one a try and if you do, please come back and let me know how you liked it and give the recipe a star rating. Your feedback is valuable to me for developing future recipes. And if you’re looking for unique ways to use spaghetti noodles take a look at Spaghetti Nests with Tomato Sweet Basil Sauce. >> Follow me on Pinterest, Facebook and Instagram for latest recipe updates! 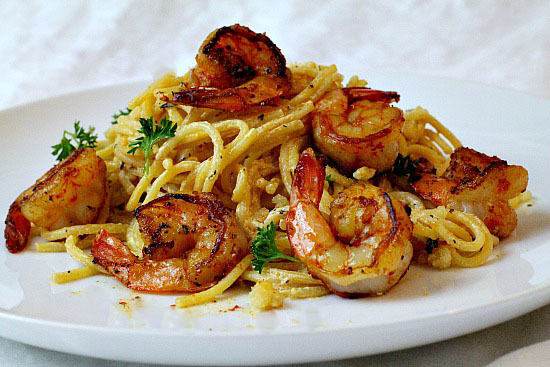 A wonderful shrimp and pasta dinner recipe. With just enough heat to spice things up. Cook the pasta in a large pot of boiling salted water until al dente, about 8 minutes. Drain, reserving 1/4 cup of the cooking liquid. Return to the pot and toss with the 1/8 cup olive oil and reserved cooking liquid. Cover to keep warm. In a large sauté pan, heat the remaining olive oil over medium heat. Add the onions and cook, stirring, until soft, about 5 minutes. Add the garlic, paprika, cayenne, thyme, and salt. Cook, stirring for 1 minute. Add the white wine and cook over high heat until nearly all evaporated. Reduce heat to medium low, add the cream, cooking and stirring occasionally until slightly reduced. Remove from heat, stir in lemon juice and keep warm. In the meantime, toss the shrimp with some additional paprika. Heat oil in a pan and cook for 1 - 2 minutes per side. Set aside, cover and keep warm. Add the cooked pasta to the cream mixture and toss to coat. Cook until the pasta is warmed through, about 1 minute. Remove from the heat and add the Parmesan Cheese. Stir in some of the shrimp into the pasta mixture, reserving a few to garnish. Serve with more grated Parmesan, small pieces of parsley. Please don't try to skimp on fat and calories and use half and half or milk. Half and Half can be finicky and curdle if not added properly. If the heat is too high, and the half and half is not at room temperature. I made this tonight, following the recipe exactly, and it turned out delicious! My husband and I both loved it! It sure had a spicy kick! I think I overlooked the shrimp, because it takes a while to turn them all over, and I burned the onions and spices but after combining everything, my mistakes weren’t noticeable.